DataTree is your trusted source for industry leading property data, reports and document retrieval. And DataTree can enhance your workflow - with speed, efficiency and transparency. Track your orders from request to completion with complete transparency – no follow-up requests or guessing when an order will be complete. Manually researched and verified, these reports use field research, First American title plant data and third-party databases to provide the most up to date and accurate information on a property and owner. Every property resides in a flood zone—it’s just a question of whether it’s in a low, moderate, or high-risk area. Order Basic, Life-of-Loan and FlexCert Flood reports directly through DataTree. Property valuations from local professionals who know the market. This BPO report uses a unique collateral evaluation analysis which includes accurate, on-demand residential replacement costs, risk analysis, and other essential property value information. DataTree conventional appraisals are managed for adherence to state, federal, and AMC regulations including the current version of Uniform Standards of Professional Appraisal Practices (USPAP), Dodd-Frank Wall Street Reform Act (Dodd-Frank), and recent Interagency Guidelines revisions. With the Market Analysis and Condition (MAC) Report, our professional network of inspectors will provide the information you need to move forward with a collateral-related decision. When used in conjunction with an AVM through DataTree, the MAC is perfect for home equity lending. Get a compliant evaluation that’s more than a technology only driven valuation, yet not a full standard appraisal. PACE reports combine the expertise of a field inspector with industry-leading DataTree data - all reconciled by a licensed appraiser. Rely on First American appraisal review services and leverage a network of experienced appraisers to help determine the most accurate property values. Order a Field or Desktop Appraisal Review directly through DataTree. Now nothing stands between you and getting the data and documents you need for your business. DataTree gives you the option to input or upload a portfolio of properties and select from a robust list of order options. 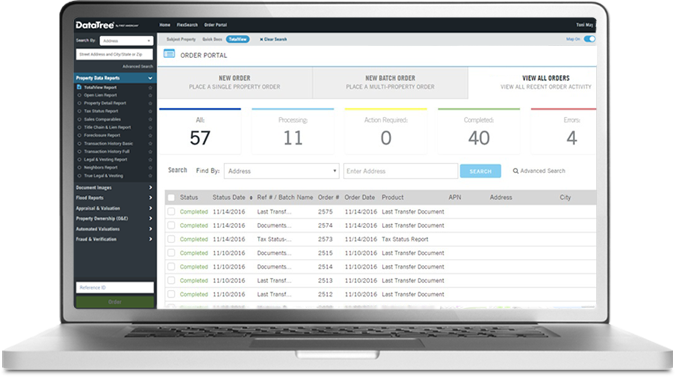 Order, track and retrieve your completed batch orders all within the same gateway. Take the “chase and place” out of retrieving recorded documents. Using the batch document retrieval option means less legwork and more efficient retrieval. Choose the Abstractor cascade and automatically send your order to an Abstractor search when documents are not available in the DataTree database. With the most comprehensive database of property and ownership information, DataTree is going to work for our customers. Users can now order the same trusted automated or professionally fulfilled reports and data exports as a self –service option. 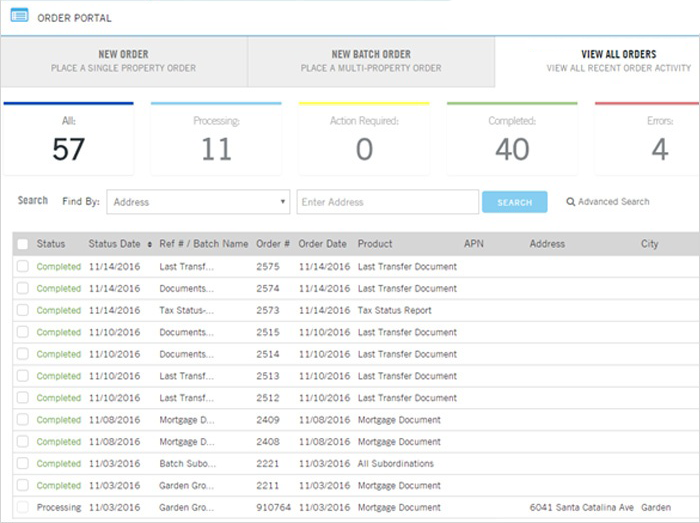 DataTree takes the time and complexity out of acquiring the data, documents and valuation services you need for a single property or list of multiple properties. Order Portal is your hub for all of the self-service features and professionally fulfilled services that are now available within DataTree.